Looking for a beer after a long day of diving and trying to find the kind of place where you can stand around in your boxers, enjoying one in a non-judgmental temple of apathy? Or are you looking for the type of place where you can randomly ask Mary Stuart-Masterson about that movie she did back in the 80’s with Eric Stoltz and Lea Thompson? (the delightful “Some Kind of Wonderful” FYI). 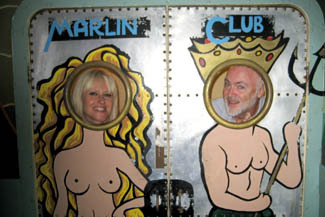 If you can answer yes to both those questions, then you might be ready for the adventure that is The Marlin Club. Located just off the main drag on Catalina Ave in Avalon, TMC is the oldest bar on the island and is what we here at CFD refer to as a character bar. Not that it has character but rather that it is filled with characters. You never know who is going to be in there. Yachties, divers, rugby players and Hollywood-types are just a few of the diverse clientele you’re likely to run into on a given Saturday night. Heck, the bartenders even live upstairs. That being said, it’s really a very non-intimidating place the lacks the feeling of desperation you’re likely to find in some of the other night spots on the island. 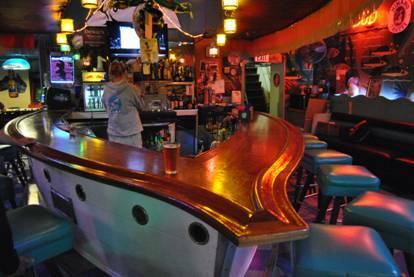 As for decor, it’s a non-descript theme that revolves around the boat-shaped bar with stools that always seem to be filled, no matter the time of day. Standard selection of beer, wine and spirits will keep you going including one of the few beer taps on the island. (It’s Michelob for some inexplicable reason.) There are your standard pool, darts and pinball to entertain as well as a couple of tv’s but the main attraction is the crowd. Usually loud but almost always friendly, it’s the type of place you’ll end up talking to the most random people but it will be entertaining I promise. Anyone for fancy mer-people restrooms? The sheriffs usually make last call around 1:30. At least it seems that way. That being said, once you experience The Marlin Club, it’ll leave a mark. That mark will sometimes be spiritual while other times being an actual mark. It’s the spiritual one however, that I’m sure will have you following the interesting looking crowd back, time and time again, to The Marlin Club. A link to one of the most impressive websites I’ve seen in 1997.